Now is the time when families are making summer plans for vacations, camps, visits to family, and hopefully some meaningful volunteering. For teens who are looking for a giveback element to their summer blended with amazing travel and cultural experiences, Adventures Cross-Country is offering $1,000 scholarships toward the travel costs for volunteer trips. 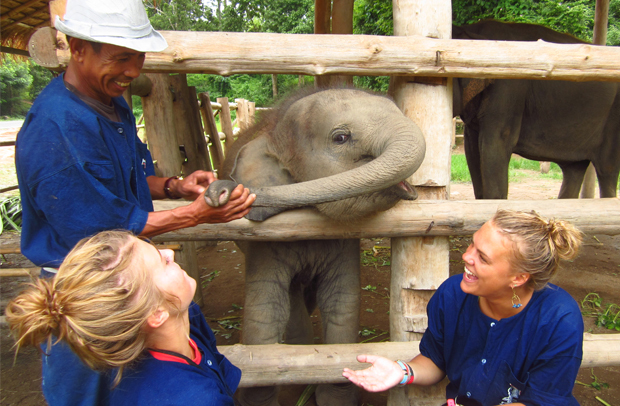 For more than three decades, the company has been creating meaningful travel experiences for youth ages 13-19, and some highlights making me wish I was age-appropriate include: Thailand Elephant Service (volunteer in a hill tribe village, overnight at a monastery with Buddhist monks, learn Thai cooking, scuba dive, white water raft, and teach English), Costa Rica Service Ultimate (community service work with school children and rural farmers, white water raft, surf, patrol turtle nests, and build a community shelter), and Hawaii Service (help preserve natural and cultural environments, work with Boys & Girls club, surf, swim, hike). Overall, they offer community service and immersion trips in 21 countries across six continents. That is SO much more life-altering and purpose-driven than the summers I spent working the drive through window at Carl’s Jr!